Petit Design Co: American Pie -- Pie Safe that is. American Pie -- Pie Safe that is. I was so excited to find this little apple! I had one growing up and so did Mr. PD. I had found one about a year ago at a flea market but the seller wanted $15 for it and wouldn't budge!!! Well, at the WLYS a nice old man had this one for sale. He was asking $3 for it and let me have it for $2! 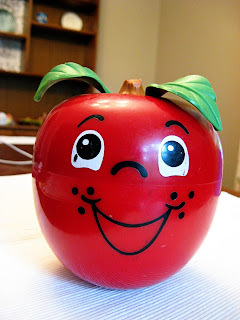 You have no idea how happy this Happy Apple makes me. Not only does it bring back lovely memories but I love the music it makes. I held this in my hands on the drive home loving the sounds it made as we hit every bump in the road! Sadly he's already gotten abused lovins from my daughter. I have had to re-attach the left leaf with super glue. So now he sits on a shelf and is a special toy to be played with gently. I love these vintage ball jars! The blue aqua color is amazing. I'm kicking myself now for not having bought 2 or 3. 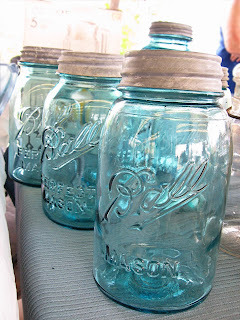 I can't get the beautiful blue hue out of my head and I will now be on the search for these vintage jars. At the moment I didn't think Mr. PD would approve of spending $5 on a jar so I didn't even try to talk the lady into letting me have 3 of them for $12. Well now I have time to research the actual going rate for these jars for the next time I come upon them. So back to the title of the post... 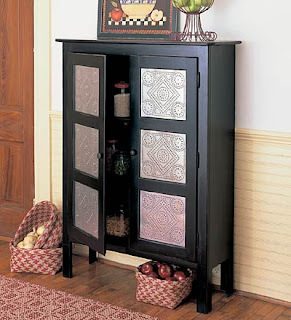 I did a little more research on the cabinet I liked and found that it is basically a pie safe that has the door panels replaced with glass. Pie Safes were used to cool down straight from the oven pies - thus the name! The doors usually had panels that were either screens, or tin with punched designs on them. These doors allowed for the goods to cool down while keeping out flies, mice, and children! I had to drive 1 hour and 20 minutes each way to get this lovely pine pie safe. But it was so worth the $67 it ended up costing me. The lady was asking $75 but she lowered the price - it doesn't hurt to ask! This is a very substantial pie safe at about 51" tall and about 45" across made of solid pine. It's not authentically old but it will look like it when I am done! 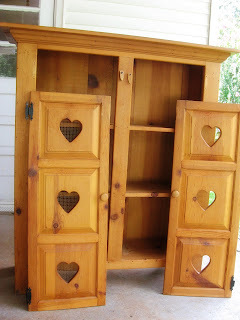 I'm not a big fan of the heart shaped panels but I think I will be able to pop them out and replace them with glass, or maybe some chicken wire - or maybe both! The question now remains what color to paint/stain this. I'm not a big fan of the orange-y pine. I'm thinking black, but I'm not sure if I'm ending up with too much black in my home. Lately I'm drawn to shades of aqua and peacock blue. I also love red - sometimes. 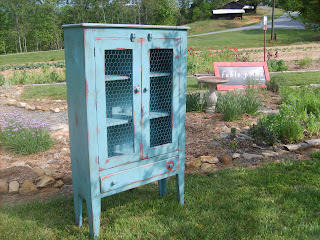 I was also thinking of painting it in an off-white distressed look with black hardware. I couldn't find any pictures of what I'm talking about. 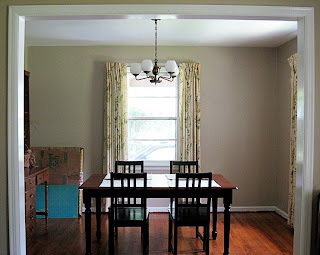 In this rental home the pie safe sits in the right hand corner behind the dining table. This room is in the process of being decorated in greens (I have to work with the current curtains), browns and teal/peacock blue for an added pop of color.) If we ever get to move back to TN it will sit in our living room which has off white walls, a cherry colored piano, a dark brown man chair, and a dark sage green couch. So it has to be able to work in both rooms. So... If this was yours what color would you paint it? Before I scrolled all the way down my first thought was that you should paint it red. Then I saw the second blue picture and I LOVE THAT. Then I saw your red and thought you have great taste. I think either of those but I'll really liking that blue one. So pretty. I vote for the aqua blue! So pretty. Depending on the look you're going for, I'd go with glass. Glass would be a little more contemporary, and chicken wire would definitely be more country, esp. if you distressed the edges. 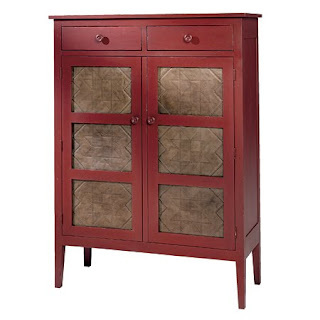 A great piece for a great price! Oh, aqua would be pretty! I just picked up a pie safe myself today for $75! I am having the exact same problem...not sure if I've got too much black furniture already! 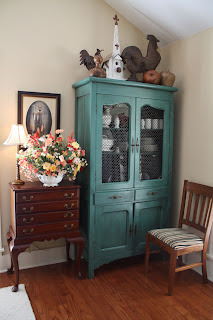 Anyway, mine has the tin panels, and I don't want to get rid of them, although I think I'd love to have copper! (I have 8 10"x14" panels so I think it would be pretty costly to replace--anyone know the going price?) I can't decide whether to stain or paint the wood! 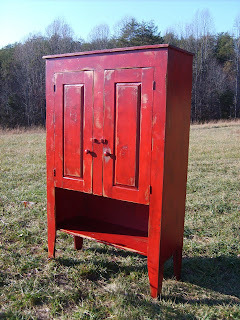 Love the black, but also love the dark cherry stain with the tin. Let me know what you decide! I wish you had left me your email so I could make sure you see my response! I'm keeping my fingers crossed so you come back to check this. I'm not sure were you live but I have 2 suggestions for you. Hobby Lobby sells copper sheets (at least copper looking) rolled up in a tube for punch metal art. With a 40% off coupon this might be an option for you. You will have to make your own design though. The other option is too look at Lowes/Home depot. Take a look at the metal tiles they have available for ceilings! 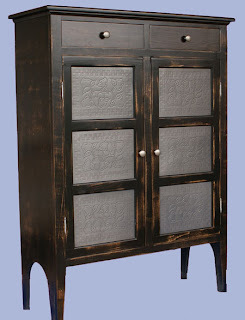 Not sure how much they run or whether they would work but worth a look and they already have gorgeous designs on them.